So, I'm a leader. A co-leader, actually, of a really awesome group of high school students. If you've been reading this blog for any significant length of time, you know that Pierce and I are actively involved with our church - Buckhead Church to be exact, which is one of five Atlanta-area campuses of Northpoint Community (also known as "Andy Stanley's church"). We are both co-leaders with Inside Out, the high school ministry, and I lead a group of about ten sophomore girls. Two weeks ago, we went to Panama City for Inside Out's annual beach trip called The Walk. I'm struggling, really, because where do I even begin? I was a leader a few years ago, back in 2011. But because of typical life circumstances - like grad school, buying a house, working full-time at a job that was not incredibly uplifting - I stepped away from my commitment to Inside Out because I wasn't able to invest in my girls or the ministry the way I wanted - and needed - to. It was hard, but it was the right thing. I saw some of my old girls - all of whom just graduated - at church sometimes and they would text me here and there. But I missed them. And I missed what God was doing at Inside Out. I never had a place to call my own in high school. Not a "church" place, anyway. I had my bedroom and my prayer journal and my Bible. I had my friend, Hunter, who encouraged me in a hundred different ways. But I didn't have a youth group or a church home. So my relationship with God was deeply personal...and somehow still very lacking. I didn't have a community. I didn't have an Inside Out. 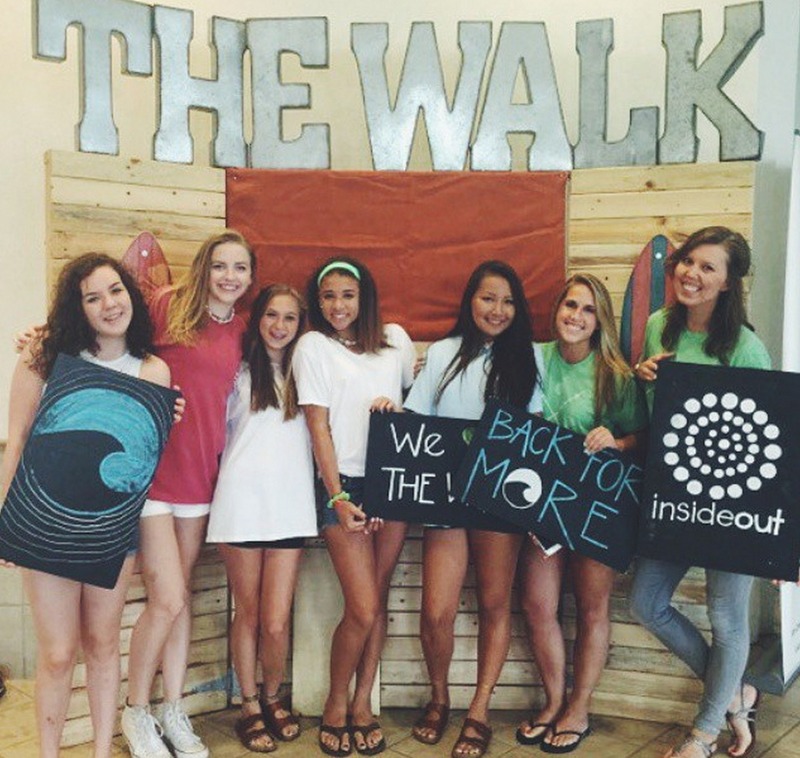 When I became a leader again in January, I stepped into the middle of my girls' freshman year. They had already established relationships with their other co-leaders and I was the New Kid. Because the group had grown so large, it was split into two and I was brought on to pair with the third leader from the initial group. The transition, for me, was pretty seamless. I was welcomed with open arms and treated like I'd been there the whole time. Not just by the other leaders, but also by the girls. Yes, friendships had already been formed, but I was offered a place at the table without hesitation. And I was introduced to a whole new type of community. The Walk itself is unlike any other church trip I've attended. From the outside it looks shiny and sparkly, just like so many others. The lights on stage are bright and perfectly timed to every song. The condos offer beautiful views of the Gulf. And the students themselves are certainly more stylish than I ever was at that age. But the similarities end there. My personal experience with church trips has often been one of isolation and judgment. The connections always felt forced and they didn't last beyond the week. Life change seemed to be purely emotional, not something that could be maintained once the suitcases were unpacked. I don't say that to diminish what those ministries were trying to do. At the time, I enjoyed those trips. But the sense of community was superficial and I never quite felt like I belonged. Inside Out is doing well what so many other high school ministries are struggling to do, and when I look at these students, I rejoice over how their lives will be impacted because of it. During our week at The Walk, the speakers built on one another's messages and every word spoken tied together like they were weaving a tapestry - a strong, visual representation of the Good News that every high school student in that room was not only loved by God, but made in His image. I watched as our girls took this message with them to breakfast and lunch and free time and small group. And they talked about it openly. They shared hurts and fears. And in those moments, I felt the shatter of something long ago broken: shame. The things they had kept to themselves because of this five-letter word came tumbling out into the light. And in that light, shame had no place to hide. It had no darkness to give it strength. And even though I know those moments won't completely heal what hurts our students have experienced, I have no doubt that God will. And because of the work of so many at Inside Out, our students can go home with the hope - and the expectation - that He is true to His word. I could say more about our week in PCB, but I'm going to stop here and just say thank you. Thank you to Shannon and Jamey and everyone else on staff with Inside Out who work so damn hard to make sure we, as leaders, only have to focus on our students. Thank you to the other leaders who have made me feel at home. And thank you to my co-leader, CC, for being my friend and linking arms with me as we walk through the next three years. Finally, thank you to our girls. Thank you for sharing your lives with us. This is what community looks like. And I'm so glad I get to be a part of it. Up To I Do: Release Day!